Paul is speaking to us in a friendly way. Grace cheerfully encourages, not threatens. In this spirit, we are called upon to live our lives in a way that is suitable to our exaltation, that is, our calling described in the first three chapters. Since truth is living and leads to practical action, our future expectation has present implications. Some associate “walking worthy” with conducting great evangelical outreaches, starting “ministries,” or being busy with church activities. But Paul says nothing of the kind here. 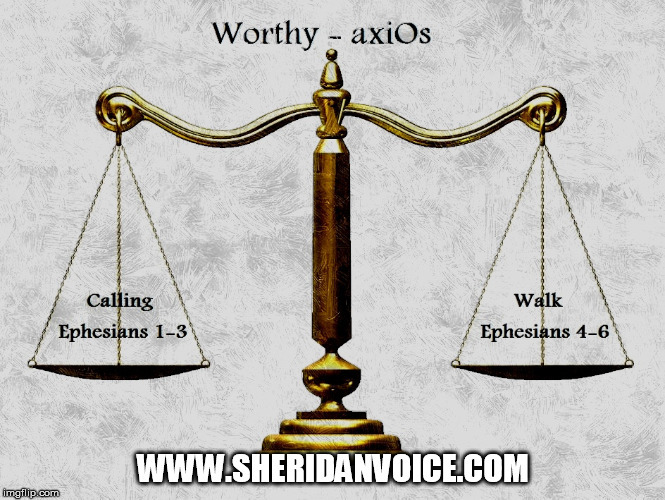 The Greek word translated worthy is axios, which means something of “equal value of the thing referred to.” The thing Paul refers to is our calling. Our walk should be as equally valuable as our calling. Paul’s readers would be familiar with this concept because it was the foundation of trade. The ancient merchants used balances for money transactions (See Photo). The bar across the top from whence the scales were hung is the “axios.” The value of an item was measured in terms of weight. If you purchased a cow, the weights that represented the price of a cow were put in one scale thus tipping it. The purchaser of the cow would then pile his coins on the other scale until both scales were “even.” The coins were worthy of the weights – sale complete! A life that balances out (axios – worthy) our calling is characterized by ALL humility, ALL meekness, together with long-suffering. In other words, we express humility and meekness all the time, patiently, through everything. Paul served the Lord with all humility (Acts 20:19), he encourages us to exercise humility, as our Lord did, by considering the affairs of others as more important than our own (Philippians 2:3), he warns us about a false showy religious humility (Colossians 2:18, 23), and finally he encourages us to put on true humility as the elect of God (Colossians 3:12). Peter, in beautiful language, tells us to be “clothed with humility” (1 Peter 5:12). Paul puts meekness opposite of “bringing the rod” in 1 Corinthians 4:21. Ponder that for a moment. Meekness is a fruit of the spirit (Galatians 5:21), we’re encouraged to put on meekness (Colossians 3:12), and told to show ALL meekness to ALL men (Titus 3:2). The Greek word translated “Long suffering” is a word that means “to put anger and wrath far away from you.” That’s why Paul says we can’t be angry and not sin. Anger always misses the mark. Long-suffering, or patience, is essential if we are to deal with each other in love. Long-suffering is more than reluctantly “putting up” with others, it is active love expressed with good deeds toward our brethren and mankind at large. Paul tells us to put on long-suffering in Colossians 3:12. These qualities were despised by the Ancient Greeks and Romans. Do our lives pass the audit of Ephesians 4:1-2?